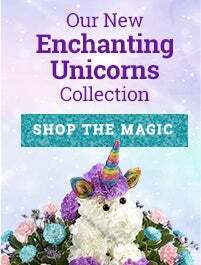 Looking to send a great gift quick? With same-day flower delivery, you can show you care with classic favorites and unique bouquets, specially created for the special people in your life. No matter how busy you are, it’s never too late to surprise family & friends with same-day flowers in a high quality, last-minute flower arrangement. 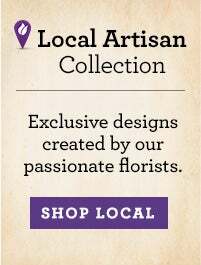 A wide range of flower types are available for same-day delivery in a variety of unique vases. If you’re looking for something traditional, roses are a timeless choice for same-day flowers: red roses for a romantic twist, or purple roses for a heartfelt smile. Mixed bouquets featuring an assortment of gorgeous blooms from roses, daisies, sunflowers and more, are artfully crafted in vases that can be a perfect match for your loved one’s personality – from bright and colorful mixed floral arrangements, to mixed pink bouquets for pink flower lovers. Our network of local florists handcraft each floral arrangement and guarantee that your fresh flowers are delivered the same day with the best quality, directly to your recipient’s location whether it is a home, hospital or office. When life gets busy, it can be difficult to remember to send flowers days in advance, even for our closest friends and family members. That's where same-day flower delivery comes in! Same-day flower delivery is a great way to express your feelings to a loved one in a timely manner. Same-day flowers delivery allows you to send flowers today, giving you a little wiggle room if you need flowers delivered at the last minute. More and more people are turning to flower delivery services online because they are a convenient and thoughtful way to brighten someone's day. So, the next time you forget an anniversary or a birthday (as we all do from time to time), sit back and relax by selecting a gorgeous floral arrangement from our same-day flowers collection! Whether you order flowers today or two weeks ago, your caring gift will still get to their destination on time. Same-Day Flower Delivery by a Local Florist – Flowers ordered with our same-day shipping option are all hand delivered by one of our local florists. Same-day florist delivery guarantees your flowers will arrive in pristine condition, perfectly arranged by expert florists. Use the chart at the top of the page for cutoff times for same-day delivery. Next day flower delivery will be used for any flowers ordered past the cutoff time. Looking for something a little more specific? 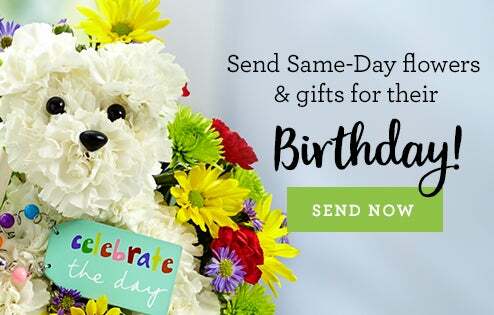 We also carry a wide variety of same-day birthday delivery and same-day sympathy flowers, though all of our categories offer products eligible for same-day florist delivery. Shipped in a Gift Box – If you don’t need your flowers same-day, flowers delivered in a gift box is another option that is available. These floral arrangements are sometimes available in bouquet form, or with a vase, and shipped through the mail. Shipping times depend on the day you order and the recipient’s location, but can ship as soon as a couple of days. Flowers shipped in a gift box usually arrive disassembled with assembly instructions included in the box. Many of our plants like succulents and cacti, in addition to blooming plants like rose plants and orchids, are also shipped via mail. Order tracking is available. A wide range of flower types are available for same-day delivery in a variety of unique vases. If you’re looking for something traditional, roses are a timeless gifting tradition whether sending red roses for a romantic twist, or purple roses for a heartfelt smile. Mixed bouquets featuring an assortment of gorgeous blooms from roses, daisies, sunflowers and more, are artfully crafted in vases that can be a perfect match for your loved one’s personality – from bright and colorful mixed floral arrangements, to mixed pink bouquets for pink flower lovers. Our network of local florists handcraft each floral arrangement and guarantee fresh flowers with the best quality, delivered directly to your recipient’s location whether it is a home, hospital or office. 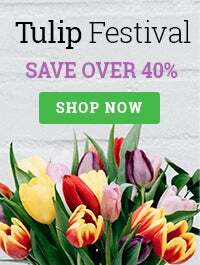 1-800-Flowers.com provides an online shopping experience that strives to offer the best quality same-day flowers to celebrate any occasion. We also offer same-day delivery for plants, balloons and gift baskets. If you have questions about same-day delivery or need gifting advice for the flowers you’re about to purchase, it’s easy to contact us with chat boxes to utilize right on the 1800flowers.com site. Our phone line is also always open at 1-800-356-9377 (1-800-Flowers). From birthdays and anniversaries to funerals and get well, our trained customer service representatives will help you find the perfect gift option today.